The holiday season sees some of the busiest travel days of the year. While travel can create lifelong memories and enable people to have new and novel experiences, it can also be a nightmare with long lines, delays, and miscommunication. Luckily, technologies like artificial intelligence are emerging to ease traveler frustrations and improve the travel experience. Humley, an AI chatbot company, recently published a study surveying 1000 Americans to better understand their concerns when booking a trip. According to the data, 84% of travelers are using services such as Kayak or Expedia when booking. However, 62% of users still find it somewhat to very difficult to find the right deal, and almost half surveyed visit between four and seven websites to find a hotel within their budget. And of course finding the right hotel is often just scratching the surface of what goes into planning a trip. You have flights, car rentals, restaurants, finding the right activities for your group and then booking them, planning out routes, and researching public transport options. To improve this experience, many travel companies are looking to AI-powered chatbots. 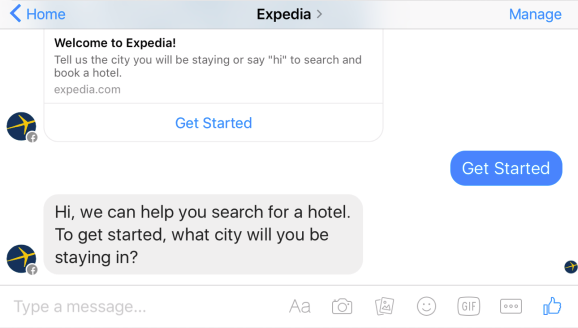 Already, Expedia has implemented a chatbot on their Facebook page to help with booking hotels and to store the itinerary information after booking. As this technology advances, I definitely look forward to letting AI take on these menial tasks. If you use a Gmail address to confirm your flight bookings, Google has a clear sense of when you’re traveling—and where. Since it also has access to such things as Federal Aviation Authority data, historic flight-status data, and geo-positional aircraft data, it can also tell you whether those plans are on the verge of being delayed. Mobile-enabled visual search (or ‘Snap and Search’) helps connect customers with precisely what they are looking for at the moment of inspiration. Customers simply upload photos via their mobile devices and are instantly returned your visually similar items. This technology is already in use by Homes.com, which uses Clarifai's computer vision technology to enable homebuyers to upload photos of homes they like and find visually similar ones. How is this useful in travel? Today, we're getting more and more inspiration from the friends and influencers we follow on social media. Instead of having to rely solely on text search, which depends on the consumer knowing the accurate name or description of what they're looking for, they can upload the photo and let AI find the destinations, hotels, or experiences that truly look the most similar. As people increasingly become their own travel agents and want to ensure they're getting the best deals and experiences, AI will be pivotal to lessoning the search and planning burden. These are just three ways AI is beginning to make booking travel easier. Be sure to stay tuned for part 2 to understand how AI is making the actual travel experience more fun!